Despite its parent Basil Read Ltd being in business rescue, Basil Read Mining is trading profitably and has a very healthy order book with contracts running not just in South Africa but also Lesotho, Namibia and Botswana. 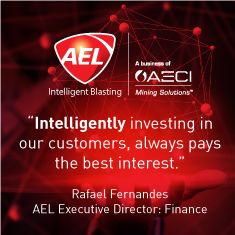 This point was emphasised to Modern Mining’s Arthur Tassell when he recently spoke with Basil Read Mining’s MD, Nathan Williams. According to Williams, the company is eager to spread its footprint beyond the Southern African region to other parts of Africa, West Africa in particular. Basil Read Mining machines working at a diamond mining contract in Botswana. Basil Read Mining (BRM) provides the full range of surface contract mining services including drilling and blasting, loading and hauling, in-pit water management, rehabilitation, and mine scheduling and planning. The company operates in both hard and soft rock and is also active in the quarrying industry through its subsidiary Blasting & Excavating (B&E), which works at 29 quarries in South Africa. Between them, BRM and B&E (which constitute the bulk of the mining division of Basil Read Ltd) have approximately 1 800 employees and operate a fleet of plant and equipment with a replacement value of over R2 billion. Basil Read Ltd, one of the iconic names of South Africa’s construction industry with a history dating back to the early 1950s, has been in business rescue since June last year. Like many of its peers in the construction sector, it has suffered lean times in recent years and in its 2017 financial year (to 31 December 2017) recorded a loss of R1 billion on revenues totalling R4,5 billion. Throughout the difficult times, however, the mining division has always traded profitably, proving to be one of the mainstays of the Basil Read Group. There has been speculation that Basil Read Ltd might seek a buyer for BRM but Williams says the business is not up for sale. BRM has a second contract in Namibia – this is at the Tschudi open-pit copper mine in the north of the country near Tsumeb. It was appointed by the mine’s owner, Weatherly International, to undertake the open-pit mining in 2014 and has been on site ever since. “This is a somewhat smaller contract than Skorpion, with now only about half the volumes, but it has been running for a long time providing us with a steady baseload of work in Namibia,” notes Williams. “It’s also been challenging at times with water inflow into the pit having proved a complication last year. We worked closely with the client to bring the problem under control and the contract is currently going very well.” He adds that BRM and B&E have had a long history in Namibia, having worked at both the Rössing and Trekkopje uranium mines, starting in 2007. In neighbouring Botswana, BRM has a long track record and over the years it has worked at all of Debswana’s diamond mines (Jwaneng, Orapa, Daamtsha and Letlhakane) and also for the Mupane gold mine, the Tati nickel mine, the Boseto copper mine and the Lerala diamond mine. Probably its single biggest contract in the country was the massive Cut 8 project at Jwaneng, in which it was in a joint venture – known as the Majwe Mining JV – with a long-standing Botswanan partner, Bothakga Burrow, and international mining contractor Thiess Mining Services (previously Leighton). Another notable contract for BRM in South Africa, though now finished, was at Assmang’s Beeshoek iron ore and manganese mine in the Northern Cape. The contract started in 2012 and extended over three years. Discussing the equipment that BRM uses, Williams says the company has a mixed fleet, comprising Komatsu and Caterpillar when it comes to rigid trucks, Liebherr and Komatsu in the case of large excavators, Hyundai and Volvo for small excavators and Bell and Volvo for ADTs plus other support fleet. “Our biggest trucks are 100-ton capacity Komatsu HD785s and Cat 777s while our biggest excavators are Liebherr R9350s, which are in the 300-tonne class,” he says. He adds that the fleet is extremely well maintained and notes that one of BRM’s subsidiaries, acquired in 2014, is Hytronix, which focuses on assembly, repairs to, and rebuilds of, heavy earthmoving equipment. Williams also believes that BRM can benefit from geographical diversification. “We’ve traditionally been a Southern African player but it’s becoming increasingly clear – and this was a message that was reinforced for me at the recent Mining Indaba in Cape Town – that there are opportunities across Africa, particularly in West Africa where the gold mining industry has shown meteoric growth in countries such as Ghana, Mali, Côte d’Ivoire and Burkina Faso,” he states. Williams, who has been at the helm of BRM for less than a year, is no stranger to the mining industry. Born and raised on the Cape Flats, he graduated from UCT with a BSc (Eng) in Chemical Engineering in 1994. His first position was with Anglo American’s Goedehoop colliery where he was a Senior Plant Metallurgist. He subsequently enjoyed a long career with Anglo, working at several of its operations (including the Cleveland potash mine in the UK) with his longest service being at Black Mountain Mining (BMM) at Aggeneys in the Northern Cape. When BMM was acquired by Vedanta in 2011, he was appointed GM and held this position through to 2014, after which he spent just over a year at Vedanta in India as Associate VP: Mining & Commercial. After this appointment, he left Vedanta, serving first as MD of Aveng subsidiary Duraset and then as GM for Minova Africa. He joined BRM as MD and Executive Director in May last year.